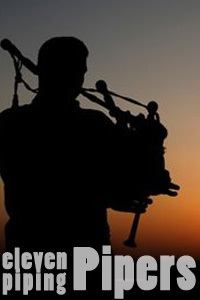 Like bagpipers, the pipers to me represent strength, death and war as well as song and dance. I put the Atonement here because gaining a deeper understanding of the Atonement is probably the single greatest sustenance my soul has craved through the hard times in my life. As much as we celebrate the birth of Christ, it is His Atonement which fulfilled the purpose of that birth. In seeking to understand the Atonement, I have gained greater and greater knowledge of my God. He is truly a God worth worshipping. Many people imagine themselves an incapable God, or an unjust God, arguing that God could be any two of all-powerful, all-knowing, or all-loving, but not all three. I argue that He is all of them, and I submit the Atonement as my evidence. Because we are neither powerful, knowledgeable nor loving, we have a very hard time understanding how a God who COULD save us from pain, who loves us enough to WANT to save us from pain, might not. But it is exactly because He is all-loving and all-knowing that He does not use His power to save us from grief and pain. That He understands the meaning of grief and pain is obvious when one reads the account of the suffering of His Son. "And he took with him Peter and the two sons of Zebedee, and began to be sorrowful and very heavy. Then saith he unto them, "My soul is exceeding sorrowful, even unto death: tarry ye here, and watch with me." And he went a little further, and fell on his face, and prayed, saying, "O my Father, if it be possible, let this cup pass from me: nevertheless not as I will, but as thou wilt." And he cometh unto the disciples, and findeth them asleep, and saith unto Peter, "What, could ye not watch with me one hour? Watch and pray, that ye enter not into temptation: the spirit indeed is willing, but the flesh is weak." He went away again the second time, and prayed, saying, O my Father, if this cup may not pass away from me, except I drink it, thy will be done." "Therefore I command you to repent—repent, lest I smite you by the rod of my mouth, and by my wrath, and by my anger, and your sufferings be sore—how sore you know not, how exquisite you know not, yea, how hard to bear you know not. For behold, I, God, have suffered these things for all, that they might not suffer if they would repent; but if they would not repent they must suffer even as I; which suffering caused myself, even God, the greatest of all, to tremble because of pain, and to bleed at every pore, and to suffer both body and spirit—and would that I might not drink the bitter cup, and shrink—Nevertheless, glory be to the Father, and I partook and finished my preparations unto the children of men." "I have thought about this a great deal. I offer this as my personal feeling. I am convinced that missionary work is not easy because salvation is not a cheap experience. Salvation never was easy. We are The Church of Jesus Christ, this is the truth, and He is our Great Eternal Head. How could we believe it would be easy for us when it was never, ever easy for Him? It seems to me that missionaries and mission leaders have to spend at least a few moments in Gethsemane. Missionaries and mission leaders have to take at least a step or two toward the summit of Calvary. Now, please don’t misunderstand. I’m not talking about anything anywhere near what Christ experienced. That would be presumptuous and sacrilegious. But I believe that missionaries and investigators, to come to the truth, to come to salvation, to know something of this price that has been paid, will have to pay a token of that same price." In order to truly feel gratitude for the Savior, in order to truly follow Him and be His disciple, each of us must walk through our version of Gethsemane. We are all investigators as much as we are missionaries. Each of us must learn to suffer, not because of our own actions, but for the benefit of others of God's children. I believe that I am learning compassion by the things that I am living, for the reasons that I'm living them. And because of that, I will hopefully be a better disciple, a true servant of Him, which is my only truest desire. Salvation is not a cheap experience. Glory to God in the Highest, and on earth, peace, good will toward men.